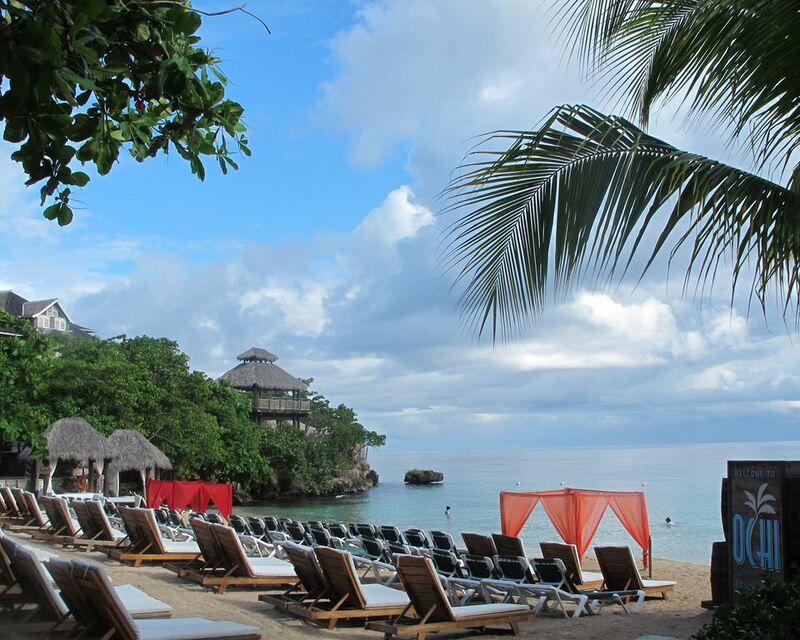 Spread across 100 acres, this 529-room tropical resort is Sandals Resorts' largest. While there are bigger all-inclusives in Mexico and the Caribbean, few pack as many options: 20 different types of accommodations, 16 eateries (plus room service in butler-serviced and Club Sandals rooms), and some unusual nightlife and activities choices that you might not expect in a Caribbean resort like a gourmet French restaurant, a Speakeasy nightclub with a great singer and a 30-foot climbing wall. Hugging a cove on the ocean side of the resort, Ochi Beach Club serves as party central, with a swim-up pool bar, eateries and activities such as beach volleyball, macho man and name-that-tune competitions and a DJ spinning tunes and inspiring dance parties. The adjacent Riviera Seaside Village offers ocean and garden-view rooms, night-lit tennis courts and a choice of lively and quiet pools as well as restaurants and entertainment venues. Across the road, seclusion seekers enjoy all-butler Hillside Village accommodations as well as the grand, three-level infinity pool and restaurants and bars of the Great House Village, all nestled into lush verdant jungle on a steep hillside overlooking the Caribbean. Frequent shuttles connect them. Suites in the all-butler Hillside Village have a semi-private pool surrounded by lush tropical greenery and flowers. Inside, carved mahogany furnishings include a high four-poster bed with a white fluffy duvet and pillows. Terra cotta floors and area rugs add a touch of color to both the bedroom and living room. A bar alcove has a stocked mini-fridge, bar and coffee maker (stocked with requested favorites). Free wi-fi is available throughout the resort. Butler-room guests get a dedicated cell phone to summon their butler. Thanks to meal delivery, couples grow to appreciate the seclusion and love sitting in their own pool and watching stars fill the sky as crickets and tree frogs serenade. Besides being on call for transportation, butlers try to help maximize guests' time by unpacking, providing orientation to the resort, making dinner and activity reservations and fulfilling requests for special things such as setting up dinner for two beside your pool. One evening, our butler Archibald walked us into our restaurant, introduced us to our waiter and poured our first glass of wine, making us feel quite special. And on our last night, we returned to our room to find a flower petal path leading to an inviting bubble bath that our butler team had produced for us. Those who want restaurants, pools and nightlife at their doorstep will opt to stay in the Great House or on the ocean side of the resort. All have the same stately mahogany four-poster beds and furnishings, Red Lane Spa bath amenities and an in-room stocked bar but since locations and services vary greatly, consider your preferences: butler-serviced/with room service or not; seaside or nestled into the hillside; secluded or in the heart of the action; near tennis courts or another amenity. Sandals Resorts has an almost dizzying selection of accommodations, and they vary from property to property. After sampling several restaurants, we settled on a few favorites. For breakfast, we loved Le Gourmand (also acclaimed for its scrumptious steak dinners) for its elegantly served steak and eggs and other breakfast delights. We liked Vista Gourmet/Sky Terrace for its sea views and changing buffet that sometimes included typical Jamaican dishes such as ackee and saltfish as well as omelets made to order, fresh papaya and other fruits, veggies, burritos and more. Our lunch favorite was Jerk Shack, where the jerk pork was succulent and spicy. Dinner standouts included island specialties such as curry goat and callaloo soup at Manor House, Kimonos for a fun Teppanyaki experience and the seaside Neptune's, where you can dine on great swordfish with your toes in the sand. As at all Sandals Resorts, Beautiful Beginnings weddings can be as elaborate (and expensive) or simple (free with a three-night stay) as couples want. Couples can choose from 14 color pre-orchestrated themes or create their own. "Your Wedding, Your Style," an interactive planning tool, helps couples picture their weddings. Once you're ready to pick a date, a dedicated planner walks couples through the process, including photography, videography, spa and hair and make-up stylists and accommodations for guests and is on hand to ensure their special day goes as planned. Wedding couples can even create their own Sandals gift registry. There are at least 17 wedding locales at this resort including a white gazebo in a garden setting, a toes-in-the-sand beach locale and a sophisticated terrace with a fountain overlooking the Caribbean. We overheard several honeymoon couples realizing that they’d been married within minutes or hours of each other, and many couples we met asked if we were celebrating a special event or anniversary. In fact, with its combination of secluded villas and hideaway nooks and active, trendy vibe, this couples resort is a natural for honeymooners and romantic getaways. Everything in the resort—beach beds and hammocks for two, romantic couples spa treatments and the relaxing luxury of being able to pack away your wallets (only butlers and spa therapists are allowed to accept tips) during your stay—says romance. Honeymooners are welcomed with a bottle of champagne, breakfast in bed and a flower-petal turndown. On our brief visit, there was far more available than we could possibly sample. Unlike at many all-inclusive resorts, golfers here enjoy free greens fees and transfers, paying only for a mandatory caddy, and golf cart, shoes and club rentals if desired, and certified scuba divers enjoy unlimited dives—although there is a charge for intro and certification courses. Each day brings a new set of scheduled activities, from “ultra sizzle” pool and beach parties, line dancing and live reggae bands to beach volleyball and dominoes tournaments. We liked that we could do almost everything we wanted without consulting our watches. Sea kayaks, water-cycles and other water toys and snorkeling and glass-bottom boat trips were available throughout the day. Pools are everywhere and there's one for every mood, from rev-it-up social spots to hidden oases. And that's not counting the small villa pools that dot the hillside. The excitement continues at night with live bands, cultural shows and themed beach and pool parties for high-energy fun, and piano, karaoke and sing-along bars, an intimate speakeasy and outdoor movies under the palm trees, with popcorn of course, for those in a more low-key mood. The resort also has two Red Lane Spas and we’d intended to succumb to a “Scents of Love” couple’s massage—a warm massage featuring indigenous aromas such as guava and fevergrass—on the pier or in the private solarium but ran out of time. Dunn's River Falls, one of Jamaica’s most touristy attractions, invites groups of visitors hold hands to help each other up the falls. One of the most fun ways to visit is on a catamaran cruise from the resort, which celebrates with drinks, snacks and DJ-fueled music and dancing on the way back. A more nature-oriented adventure is tubing down the White River, which has some gentle rapids and passes through bamboo groves, coconut plantations and local communities, with a stop to play Tarzan and swing into the river and sip Red Stripe beers. Dolphin swims, horseback rides splashing along the beach, and bobsledding (on wheels) or zip-lining or riding a chairlift through the canopy are among the adventures at Mystic Mountain. For another side of Jamaica, history buffs can join a Segway tour through historic Prospect Plantation, where you’ll also learn about local crops and that famous Jamaican jerk sauce. Island Routes Caribbean Adventures, which has tour desks in each lobby, offers Sandals-vetted excursions to these and other nearby attractions. Ochi is billed as a beach resort. The beach is lovely but the beachfront is small and compact and divided into two sections by a deck, so it’s not a place for long strolls along the sand. Also, beach lovers should keep in mind that the resort covers 100 acres; it can take 20 minutes or more to get from some of the rooms to the beach. On the other hand, the resort’s lush tropical beauty is awesome and the laid-back seclusion of the beach villas can be a nice balance to the party-hearty pools and Beach Club. As tennis players, we loved the well-maintained courts, got great pointers at the free group coaching sessions from Chris, the on-site pro, and appreciated use of their rackets. Sadly, though, they all needed to be restrung and re-gripped. We also found the two-hour trip from the airport a minus, especially on a short stay. Plus, we weren’t careful about our flights and ended up adding hours to our travel time, so we stayed four nights but only had three days at the resort. Our only other beef is that with so much going on, it’s hard to stay on top of it all. Having menus--not just a list--for all the restaurants and a weekly activity summary in the rooms would be helpful. Also, perhaps because the resort had recently re-opened, employees—even butlers—were uneven in their knowledge. One couple, who specifically came to scuba dive, said they barely got to dive due to multiple scheduling confusions, and it took a bit of effort on our part to figure out where and when tennis classes were held. This resort seems custom-made for couples who like a young, hip vibe. Most guests are in their 20s to early 40s and from the United States, but there are 50-somethings and boomers grooving right alongside them. Dress at night is resort casual; even the formal dining spots only require long pants and collared shirts for men. Ocho Rios, St. Ann, Jamaica, W.I. Nearest airport: Sangster International Airport in Montego Bay (MBJ), 1.5 to 2 hours by car or bus. As is common in the travel industry, the writer was provided with complimentary accommodation and meals for the purpose of reviewing those services. While it has not influenced this review, TripSavvy.com believes in full disclosure of all potential conflicts of interest. For more information, see our ethics policy. How Is the Food at Secrets Wild Orchid in Jamaica?